Someone should tell Amazon and UPS that you have to destroy the head. 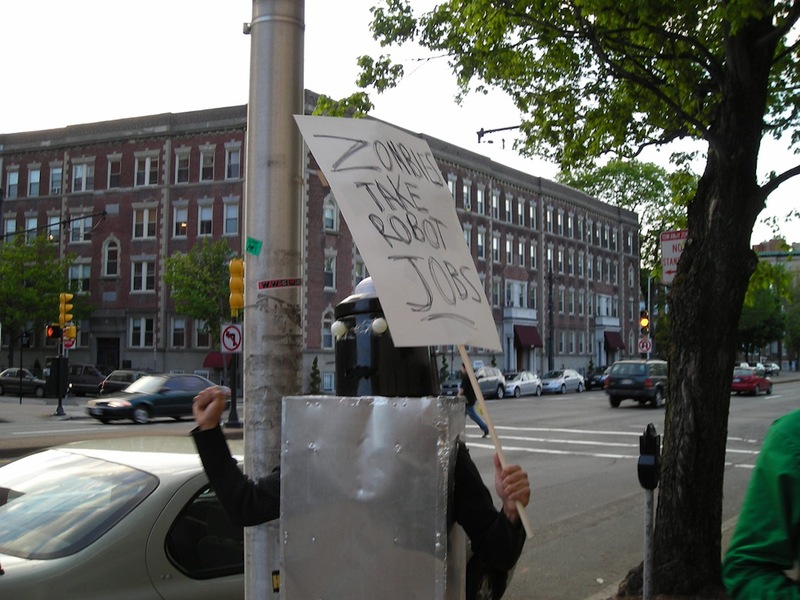 If there are two things that scare the bejeezus out of us, they’re zombie apocalypses and evil robot apocalypses. It was only a matter of time before someone combined them into the perfect geek terror machine, and that someone is hacker Samy Kamkar. Kamkar has equipped a flying drone with the ability to turn nearby drones into its zombie slaves. Kamkar has created what he calls SkyJack, which allows his Parrot AR.Drone to autonomously fly around using a small Raspberry Pi computer to search for other drones. When it finds one, it spreads its zombie plague by automatically disconnecting the control device and causing the drone to fly around on its own as directed by the hacker drone’s on board hive-mind. Then the search for its next victim begins. He can even connect to the zombie drones (which we really wish were two word we never had to put together) from his computer, monitor their camera feeds, and send them instructions. It’s really freaky to see in action, and even Kamkar looks a little startled when his drone starts flying around the room by itself in the demonstration. Kamkar is a skilled hacker who was once convicted for his Samy worm that took down MySpace in 2005. Since then, he has been putting his energy into legal hacks like the “evercookie,” which sounds like a Willy Wonka candy but is actually a browser cookie that is extremely difficult to get rid of, and now zombie drones. Right now, his zombie drone system is specifically programmed to target other Parrot AR.Drones—500,000 of which are out there in the world just waiting to become a flying nightmare army. However, Kamkar shows in the video that all he’s doing is looking for Parrot wireless addresses, so it wouldn’t be that difficult for him to tweak it to seek out and control a wider range of drones. We really hope Amazon and UPS managed to lock down their drones’ WiFi signals securely, because we’d rather our flying delivery men didn’t show up asking for brains instead of signatures.